Google today launched version 1.2 of its Flutter cross-platform UI framework at MWC Barcelona. With this, Flutter now features support for Android App Bundles, Google’s latest technology for packaging Android apps more efficiently and for creating instant apps, too. In addition, the framework lays the groundwork for helping developers accept in-app payments and adds a number of new web-based tools, too. It’s only been a couple of months since the Flutter team shipped version 1.0. In case you are wondering what happened to version 1.1: that was last month’s beta release and the team plans to ship roughly one 1.x update every month. Unsurprisingly, this update comes with the usual stability and performance updates, as well as the latest Dart 2.2 SDK (by default, Flutter apps are written in Google’s Dart language), but the team also notes that it worked hard to improve iOS support, too, with support for floating cursor text editing, for example. While Flutter always focused on mobile, the team also recently started talking about building desktop apps with the framework. To prepare for that, version 1.2 now features new keyboard events and mouse hover support. Project Hummingbird, the Flutter team’s project for bringing Flutter to the web, will also become available as a technical preview in the next few months. 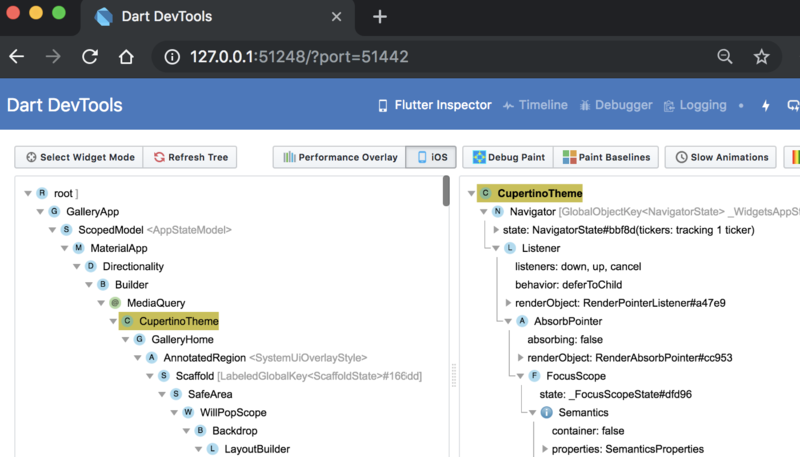 As far as the new dev tools go, it’s worth noting that Google already built Flutter support into Android Studio and added tools for Microsoft’s increasingly popular Visual Studio Code. Now, it’s also building new web-based programming tools, the Dart DevTools. These run locally and include a widget inspector, a timeline view, a source-level debugger and a logging view. For now, these tools are officially in preview and are available for installation alongside the existing VS Code and Android Studio extensions and add-ins. “We plan to invest further in Dart DevTools as a first-class unified tool for Flutter developers, and as integration for web-based experiences improves, we plan to build these services directly into tools like Visual Studio Code,” the team notes in today’s updates. In addition to today’s launch, the Flutter team also announced a new contest: Flutter Create, which challenges developers to build something “interesting, inspiring and beautiful” with Flutter using 5K or less of Dart code. Among the prizes is a $10,000 iMac Pro, which, at 128 GB of RAM, isn’t likely to struggle with that 5K code base.